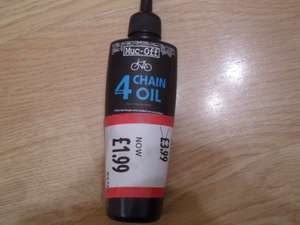 Muc-Off 4 Step Chain Oil. Aldi £1.99 From £3.99. Selected Stores Only I Guess! Picked a couple of these up from Aldi Hinckley Road,Coventry store earlier today. They were in a crate outside the entrance,along with other cycling stuff like slime bike tyre sealant,bike lights,compression cycling wear,cycling shoes and other stuff all at half price. I assume it's selected stores so might not be worth a special journey as i went to another Aldi straight afterwards at Bell Green Coventry and the same items were still full price.